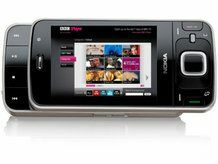 BBC iPlayer on loadsa mobiles! The BBC has announced it will be making its iPlayer content available to a greater number of mobile phones as it has finally sorted out issues with DRM. The reason for the delay is partly down to the fact mobile users could only stream the content before, as BBC's licences meant shows could only be kept for a limited time. But the Beeb has signed a deal with technology and licensing companies CMLA, Core Media and Intertrust so it can use OMA DRM 2.0, a right management system for mobile phones. This means shows can be kept on the handset to be watched whenever you fancy (within a time limit... we're not sure how long this is going to be though... probably around 30 days if other devices are anything to go by). The BBC is also going to making the programmes available to a greater number of PMP devices as well, as it gradually works through compatibility issues. However, Apple iPhone and iPod touch users won't be getting to keep programmes on their handsets; BBC Mobile Controller Matthew Postgate has said in a blog that Apple doesn't license its DRM to others, nor does it support OMA DRM 2.0. The BBC iPlayer's popularity has skyrocketed as more devices have been added to the compatibility list, which must make the technology bigwigs at the Beeb pretty happy, given the acrimonious start the idea had.